GOV.UK is the new home of HMRC information since we completed transition of all government agencies and arms-length bodies in December 2014. This means that millions of users now come to GOV.UK for information about Self Assessment tax returns. This includes things like who has to fill in a return, how to get help and how to pay your bill. Many of the 10 million people who need to fill in a return leave it close to the 31 January deadline before filing their returns. So this January, we set up a small group of content designers to carry out an in-depth review of the entire Self Assessment topic, working with colleagues at HMRC. 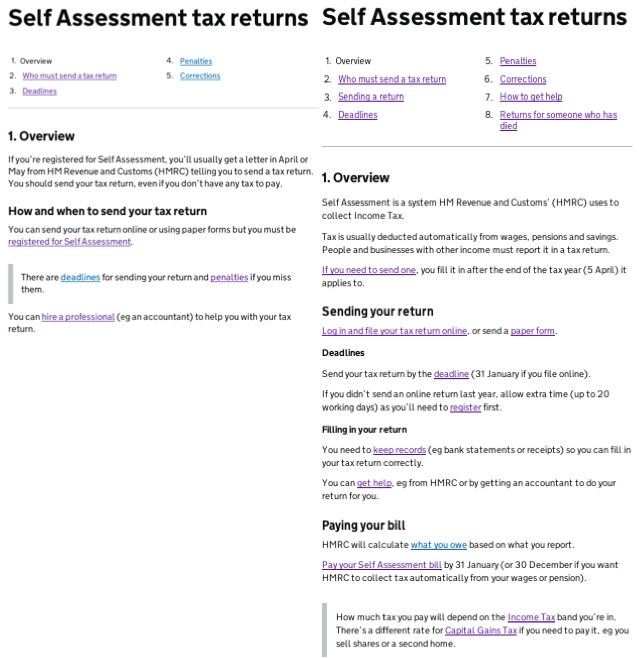 We couldn’t change the tax return itself as it’s part of HMRC’s online services, but we could look at making Self Assessment content better serve user needs. We started by visualising the existing content on GOV.UK by each stage of the Self Assessment process. This high-level understanding of the user journey helped us to identify links that needed to be added between content items to help users find things more easily. We also reviewed data from searches on page and user feedback (from Feedex) to identify where we could improve user journeys. 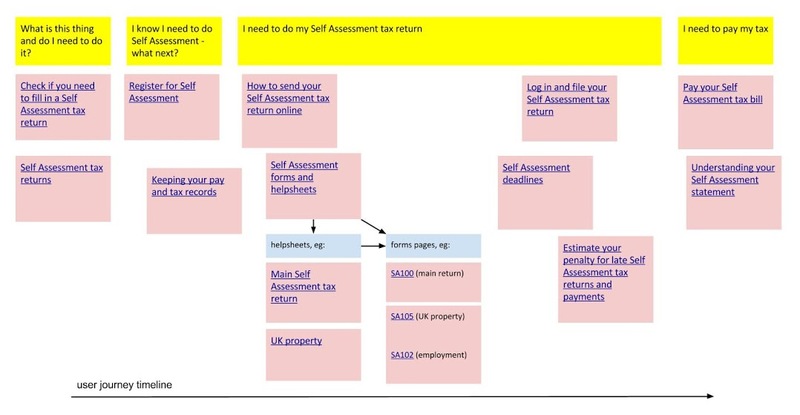 For the Self Assessment tax returns guide we found that around half of both on-page searches and user comments were related to users looking to log in to HMRC online services. We added in links at various appropriate points throughout the guide, resulting in on-page searches decreasing - and related comments dropping to zero. Working in this way, we made some other big changes to the Self Assessment guide. This had previously been through many smaller factual and stylistic updates in the 30 editions since it was published in July 2012. Reviewing data increased our understanding of user needs so we could make informed decisions about how to improve the content. 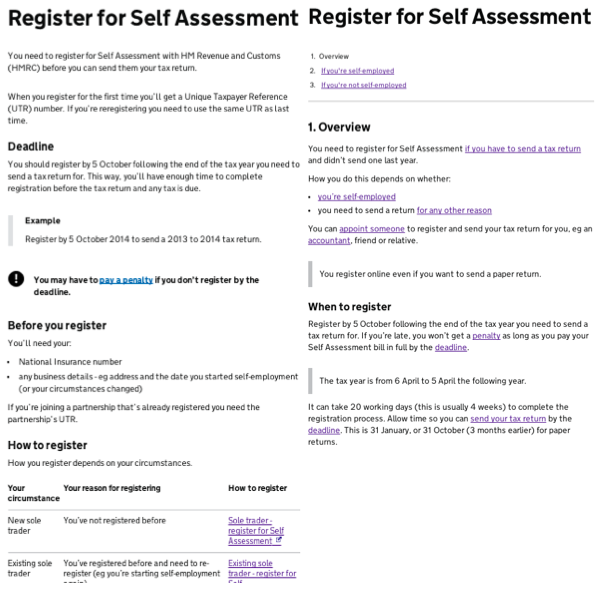 We also looked at the information for users looking to register for Self Assessment. We realised the existing content wasn’t clear enough, and needed more context to point different users to the appropriate next steps. We learned that the registration process varied widely depending on whether the user was self-employed or in Self Assessment for another reason. So we turned a single-page piece of content into a 3-part guide to address the questions we knew that users were asking. We will monitor this content for user feedback and to check that on-page searches fall. Users’ needs changed as the 31 January deadline for filing their return and paying their bill approached. We checked on-page searches and Feedex comments every day for every piece of Self Assessment content. We wanted to identify any problems that were arising as soon as possible. For example, we spotted a high number of users searching for ‘paying’ (and related terms) on the Log in and file your return page - over 30 searches on both 25 and 26 January. So we added a link to Pay your Self Assessment tax bill on the right-hand side of the page, and searches fell. As the 31 January deadline approached, the number of comments left by users on the Pay your Self Assessment tax bill page went up from around 3 a day to 12 a day. Many of these were from users who wanted to know how to phone HMRC to pay their bill. As this isn’t an option for payment, we added a prominent line in the ‘Overview’ chapter letting users know. As a result, the number of comments about paying by phone dropped to zero. By the end of January, we had iterated almost every piece of Self Assessment content. In some cases this was a full rewrite, in others a tweak. We achieved a lot in a short amount of time in January. We recognised that by starting some of this work earlier we could get better data about how our changes were improving things for users. The Self Assessment pages were the most visited on GOV.UK during the peak in January but we weren’t able to display them in the ‘Popular on GOV.UK’ list. We know this is a quick and easy way for users to get to the content they need and we are working to improve this for next time. There’s still much to do. We’re continuing to build on our cross-government content strategy principles to develop this way of working. We will continue to evaluate the way users respond to our changes, and to identify things we’ve missed or need to improve. And that's agile content. Chapeau! What if you need to claim money you are owed such as mileage which is not covered under PAYE? Do you have to register again? I will be owed thousands under this change having been told I no longer need to complete a return.